When it comes to filing the I-751 Waiver, the key word to consider here is good faith. 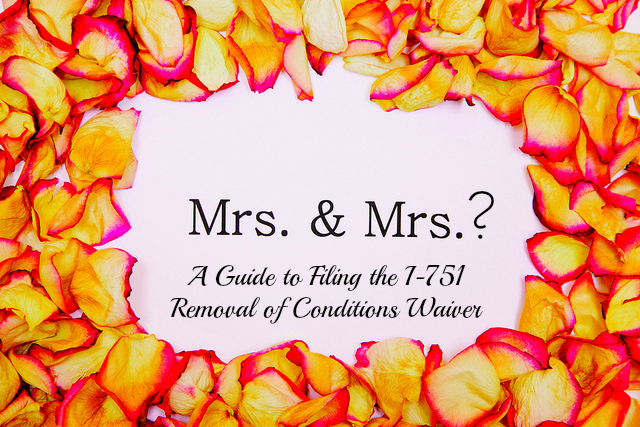 In order to successfully request a waiver of the joint filing requirement, the conditional resident, also known as the applicant, will need to prove to USCIS that even though their marriage ended in divorce or annulment, they entered the marriage in good faith. What is being proven, in other words, is the intent that the conditional resident had in entering the marriage. One may ask themselves how can I prove that I entered the marriage to my U.S. Citizen or LPR spouse in good faith? There are several documents that can be provided to meet this criterion. First, the conditional resident can prove that they entered the marriage in good faith by providing evidence that a bona fide marriage did exist between the couple. Such evidence can include but is not limited to: a copy of the marriage certificate, which is the most fundamental and basic way that the conditional resident can prove that a marriage did in fact exist with their former spouse, however on its own this evidence is not sufficient in establishing that the conditional resident entered the marriage in good faith. In addition to the marriage certificate, the conditional resident should provide copies of birth certificates of any children that were born of the conditional resident and former spouse. The conditional resident can also provide photographs in which they appear with their former spouse together in various places and situations since becoming a legal permanent resident and photographs that establish that the couple has spent time with family and friends. Additionally, the conditional resident can also provide evidence corroborating that a genuine relationship in fact did exist, by providing consistent evidence of correspondence with the former spouse such as: emails, text messages, cards given to one another, or letters written to one another. These items also do not, on their own, establish that the marriage was entered in good faith, but just like the photographs, they can guide USCIS, and indicate that the couple had a consistent relationship and consistent communication with one another on an intimate level. Evidence that is much more concrete and substantial is evidence that proves that the couple had commingled finances, joint ownership of assets or liabilities, and evidence of cohabitation. This type of evidence serves as the backbone to your case. Evidence mentioned above simply supplements this more concrete evidence. In our practice, we ask the conditional resident to provide joint tax returns and wage statements since becoming a legal permanent resident. This evidence establishes that the couple had commingled finances. It also establishes that the couple had been living together throughout their marriage. Lease agreements or deeds of ownership of all places where the conditional resident and former spouse have lived are necessary to establish that the conditional resident and former spouse were living together during their marriage. Mortgage contracts showing joint occupancy and/or ownership of your communal residence also indicate that the couple was living together consistently. The lease agreements and deeds of ownership must include the names of both the conditional resident and former spouse or at least corroborate the address at which the conditional resident lived with their former spouse during their marriage. The purpose of providing evidence of a joint bank account is twofold. A joint bank account can help prove joint occupancy and is evidence of joint finances. We recommend that the conditional resident provide bank account statements from their joint account since becoming a legal permanent resident (include 1 statement every 3 months since becoming an LPR). Joint loans, joint insurance policies showing the conditional resident as the beneficiary, joint ownership of assets, and joint utility bills are also very important in establishing that the conditional resident entered the marriage in good faith. Lastly, our practice includes a notarized detailed statement from the applicant/conditional resident explaining the narrative behind their relationship including how the conditional resident met their former spouse through which they gained their conditional residence, how their relationship unfolded, what caused the breakdown of the relationship in detail, and any other pertinent information based on the situation. We also ask for notarized affidavits sworn by at least 2 family members or friends, who have observed and spent time with the conditional resident and former spouse throughout their marriage, and can attest that the conditional resident entered the marriage in good faith. The affidavit must be detailed and include anecdotes, dates, and frequency with which the affiant spent time with the conditional resident and former spouse. Our office understands the sensitivity surrounding such cases. While the process may be invasive, our staff understands what conditional residents are going through in such cases, and we work to assist applicants in every way possible to make the process as stress free as can be. If you gained your conditional residence through marriage to a US Citizen or LPR and are interested in filing a waiver for the joint filing requirement, we are happy to assist. Please click here to visit our website.